Can you believe the legendary Toyota Land Cruiser has been around since 1957? Elvis was in Graceland, Eisenhower was in the White House, and America's favorite off-road vehicle was already starting to show up in America's garages. Flash forward almost 60 years, and the Land Cruiser is Toyota's most luxurious SUV, but it has not forsaken its rugged off-road roots. If you want to see how highly-evolved the latest Land Cruiser is, drop by Venice Toyota for a first-hand look at the 2016 model, available in a number different trim levels and accessory packages. Come in early for the best selection. We are centrally located at Venice, FL, and highway-close to Sarasota, Bradenton, Venice, North Port, and Port Charlotte. Everyone is welcome to test drive the 2016 Toyota Land Cruiser because it offers amazing features to please the pickiest perfectionists, and a fearless V8 engine to tackle the toughest terrain. A meaty 5.7-liter V-8 putting out 381 hp and 401 lb-ft of torque is just the beginning of Land Cruiser's awesome capabilities. Add to that an upgraded powertrain and new eight-speed automatic transmission, and the Land Cruiser is now able to leave other SUVs in the dust, even when towing a heavy load. For forging new trails off the beaten path, the Land Cruiser eats up the rough road like a glutton, thanks to the four-wheel-drive locking differential and formidable ground clearance. On the highway, the patented Kinetic Dynamic Suspension System engages the anti-roll bars; when you go off the road, the dynamic suspension loosens up to accommodate difficult patches of gravel and dirt. Also new for 2016 are a refreshed front clip and a more streamlined hood, which accentuate the piercing LED projector beam headlights and power bulges. In case they missed it, your impressive Land Cruiser dazzles your admirers even more on the flip-flop, sporting incredible light-tube taillights and LED brake-lights that make it look more like a UFO than an SUV. Now, let us step inside America's most trusted AWD vehicle. Whoa!!! Look at all the high-tech amenities, neatly arranged and ergonomically designed, and layered in tasteful chrome accents! Even your kids will be impressed with the limousine-worthy comfort, spacious interior and internet connectivity. Who can argue with a four-zone climate control system that provides separate temperature settings for driver, front passenger and each of the rear-seat occupants? If you get hot under the collar when your in-laws are in the car, you can give them the cold shoulder! The driver's seat is like a futuristic cockpit designed around the brilliant dashboard display, and the rear seats are like reclining movie theatre seats aimed at the backseat DVD players and entertainment center. You get all the niceties of a high-end luxury SUV with enough cargo space to transport a small army - 81.7 cubic feet. 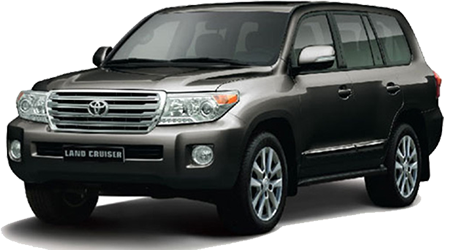 Come to Venice Toyota at FL, FL, and have a face-to-face meeting with the fabulous new Land Cruiser. It is difficult to describe the Land Cruiser's revered off-road capabilities, but let's just say the advanced new drivetrain and limited-slip differential will take you places other SUVs fear to tread. We will be more than happy to oblige and we love accompanying people on a thrilling ride in the ever-popular Land Cruiser. If you live in nearby Sarasota, Bradenton, Venice, North Port, and Port Charlotte, FL, you are close enough to make Venice Toyota your destination dealership for the durable and hardy 2016 Toyota Land Cruiser.